ST. PAUL, Minn. – Are falls a concern to you or your workers? Do you regularly inspect walking-working surfaces, correct and guard against hazardous conditions? 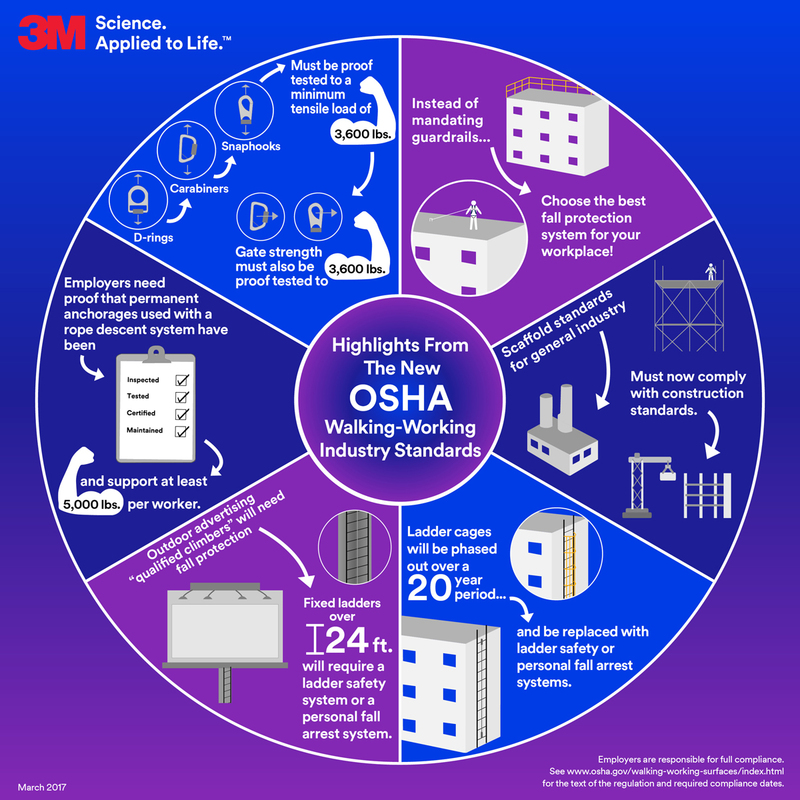 Are you committed to a safe working environment at your company? Keeping current with legal changes is a necessary first step. In November of 2016, OSHA published its final rule on Walking and Working Surfaces, updating the existing standard. These new updates apply to all general industry workplaces, covering surfaces like floors, stairs, ladders, ramps, scaffolds and elevated walkways. This final rule also covers a wide variety of general industries, and although it does not change current agricultural or construction standards, these new standards are meant to more closely align with modern construction requirements. It’s now been over a year and are you making the right steps to be compliant? For instance, falls from any height can cause traumatic injury. Understanding how to comply with these new standards is key to protecting your employees and achieving compliance, helping to avoid penalties and, more importantly, tragedy. Want a quick, informative way to walk through these newly, updated rules? Check out our clear and concise video that gives a detailed recap of OSHA’s latest changes that became effective January 17, 2017. If you still need help, contact our technical specialists to discuss what education, training and products you still need to keep your workers safe and your worksite compliant. The final rule adds requirements on the design, performance, and use of personal fall protection systems. There are staggered compliance deadlines that give companies time to evaluate their current equipment and safety systems and take the needed steps to achieve compliance in order to prevent slips, trips and falls in the workplace. Instead of mandating guardrails, employers can choose the fall protection system best for their workplace situation. Scaffold standards for general industry must now comply with the standards for construction. Fixed ladder cages and wells will be phased out and will have to be replaced with ladder safety systems or personal fall arrest systems, such as vertical system solutions, over a 20-year period. Outdoor advertising “qualified climbers” will need fall protection, and fixed ladders over 24 feet will require a ladder safety system. Employers must regularly inspect surfaces to help prevent future issues and training on new equipment must be provided. Additionally, employers need proof that permanent anchorages used with a rope descent system have been inspected, tested, certified and maintained as capable of supporting at least 5,000 lbs. per employee attached. Finally, these new rules require that D-rings, snaphooks, and carabiners be proof tested to a minimum tensile load of 3,600 pounds without cracking, breaking, or incurring permanent deformation. OSHA also added a new requirement to final paragraph (c)(8) specifying that the gate strength of snaphooks and carabiners also must be proof tested to 3,600 pounds in all directions. This direction aligns with ANSI/ASSE Z359.12 standard for Connection Components for personal fall arrest systems. We encourage you to download our infographic that provides some useful tips about some of these new, important changes. To help you on the journey to comply and learn more about the specifics of the finalized rule by OSHA, we invite you to download our complimentary white paper that provides a helpful regulation summary of all the changes now mandated. The complete text of the final rule by OSHA can also be found here.